for their Sunday morning broadcast on 9510kHz via the IRRS facility in Romania. As Adventist World Radio enters into its 41st year of international radio broadcasting, we take pleasure in announcing our annual “Wavescan” DX contest, which comes to you under the title, “Listen to AWR”. In short, you are invited to listen to as many different AWR shortwave locations as possible during the month of July 2012. You are invited to listen to as many shortwave locations in use by Adventist World Radio as possible during the month of July 2012. You may listen to the broadcasts from the AWR station KSDA on the island of Guam, and to any and all of the shortwave relay stations that carry programming from Adventist World Radio. Remember also that the AWR DX program, “Wavescan” is on the air shortwave over several of the stations in the regular AWR network, and also from shortwave stations WRMI & WWCR in the United States. In due course, you will be able to obtain the July scheduling of Adventist World Radio, and the relay stations in use at the time, from the AWR website on the internet, from contemporary radio bulletins, from the World Radio TV Handbook, and from other reliable information sources. You are invited to prepare just one reception report for any AWR transmission from each AWR transmitter site in any country that you are able to log during the month of July 2012. You may report any AWR broadcast on any shortwave frequency, at any time of the day or night, and in any language; just one reception report for each AWR shortwave location. You are invited to search your QSL collection, and where possible, provide a photocopy of a QSL that you already hold in your collection from any of the AWR shortwave stations that you have heard, during the past five years only. These photocopies should be in color if possible, but black & white is also acceptable. If you do not already have a QSL from any of the AWR stations you select, then you should state so in your contest entry. Post your entry with all items to Adventist World Radio in Indianapolis, remembering that the total number of AWR transmitter locations you hear, and neatness and preparation, will all feature in the judging procedure. Due consideration will also be given to the area of the world in which the contestant lives. Well, there you have it, the details for our Wavescan 2012 “Listen to AWR” DX Contest. This contest will run through the month of July 2012, and all contest entries should be postmarked at your local post office anywhere in the world on any date up to the end of the month of July, and they should be received at the AWR post office address in Indianapolis no later than the end of the month of August 2012. Return postage in the form of currency notes in any international currency, or mint postage stamps, or IRC coupons would be welcome. Where possible, a self addressed return envelope, business size or half quarto size, would also be welcome. The awards for this year’s 2012 contest will be similar to all previous contests. There will be a special award for the world winner, one of the Jerry Berg radio history books; and World Radio TV Handbook 2013 for each continental winner. In addition, there will be other special awards as well as AWR souvenirs and radio curios for many participants. You can remember that all AWR reception reports will be verified with a specially endorsed AWR QSL card. Please remember that it will take a period of many months, well into the new year 2013, to process all of the contest entries and reception reports, but each will in due course be processed. Today's afternoon, I received a QSL card of Radio Marti, as well as brochure and frequency schedule of Radio and TV Marti for my reception report, dated 27th May 2012. Many thanks! Muchas gracias! This year, Australia’s public service broadcaster – which started in 1932 with just 12 radio stations - turns 80. To celebrate, the ABC is devoting this weekend to the new showcasing the old, with the broadcaster’s new digital station broadcasting the sounds of Australia from the ABC’s vast archives going back over the last eight decades. The name of the station is ‘ABC Turns 80’ – a special events digital station broadcasting from 29 June to 1 July, 2012. From the 1932 Melbourne Cup, to the then Prime Minister Gough Whitlam's dismissal, to 9/11, the broadcaster will cover significant historical moments and trace the way Australia has changed – politically, socially and culturally. “Over the past eight decades, there’s been an incredible revolution not only in the development of Australia, but also in the development of the media landscape – and what better way to showcase the wealth of material we’ve collected than through the lates radio broadcasting technology – digital radio” said Tony Walker, Manager, ABC Digital Radio. The reception report was sent to the station e-mail addres rik@cybc.com.cy. This is the second time, I sent a reception report to CyBC, let's see if they reply to this one. 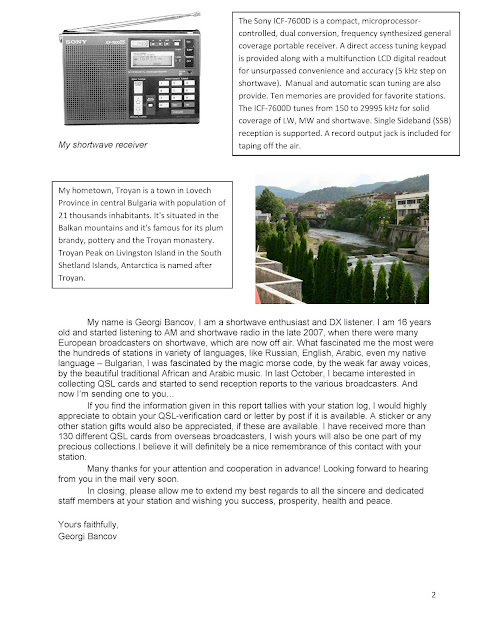 For those listeners who enjoy picking up shortwave broadcasts and sending in a reception report, this is your last chance to dispatch your SINPO to our P.O.Box 222, 1200 JG Hilversum, The Netherlands, or letters@rnw.nl (subject: 29 June Reception report). We'll return the favour by sending you a special QSL card commemorating the closing of RNW's English service! Yesterday, I received a QSL card from Radio Tirana for one of my reception report of their Sunday morning broadcasts on 7390kHz, I sent them during the spring. The info on the back side was written in German, so It has probably came from the German department of Radio Tirana. Today I received a QSL certificate and a personal letter from Radio Kuwait for my reception report on their English language broadcast to Europe on 15540kHz. Please, check the page with my QSL cards from the topmenu of the blog to see more information about my collection. The summary is nearly 170 QSL cards from more than 50 countries, verified since October 2012, when I started my verifying activities. 1500-1600 on 9526 JAK 250 kW / 010 deg to EaAs, but good reception in BUL. I received another Hungarian pirate - Lightning Radio, who plays mainly rock and indie music. I heard it on 7600kHz with good and stable signal, 35433. He is broadcasting with 25 watts in Amplitude Modulation and can be heard in most of Central Europe. Occasional digital mode utility QRM was observed during the broadcast, otherwise clear and audible program. 0200 UTC - 6165 and 11640 kHz from Bonaire, aimed at North America (East). That's late on Thursday evening 28 June, local time! 0300 UTC - 11640 kHz from Bonaire, aimed at North America (Central and West). That's late on Thursday evening 28 June, local time! Our distribution department is putting in a lot of effort to see if we can add some more transmitters aimed at other parts of the world. This will allow listeners in a large area of Europe to share the last two hours of RNW English on air. Pacific stations, like Vanuatu, Solomon Islands, Micronesia, etc. Announcing Vatican Radio’s intention to reduce its Short and Medium Wave transmissions to most of Europe and the Americas, starting July 1st, the Director General, Fr Federico Lombardi, today spoke of what he called, “A new chapter in the history of Vatican Radio” as it evolves “from Short Waves to new communications strategies”. Here is the full text of his comments. “After celebrating its 80th birthday last year, Vatican Radio is ready to open a new chapter in its history by committing its message of service to the Gospel and the Church to new communication technologies. Vatican Radio’s 40 different language programmes can currently be received via satellite and the internet, and are rebroadcast by around a thousand local radio stations on FM or Medium Wave in over 80 countries around the world. They are also available live on five web channels, on demand and in podcast, from Vatican Radio’s website at www.vaticanradio.va Written reports and texts on the website represent 40 languages in 13 different alphabets and provide a wealth of information. Daily RSS feeds and newsletters are sent to subscribers in a variety of languages, including Chinese, Hindi and Tamil, aside from European languages. Close collaboration between Vatican Radio and the Vatican Television Centre has led to the development of on-line video services and an innovative instrument called the “Vatican Player”, which offers sound and images of Papal events, live and on demand, texts and written reports related to those events, and a permanent link to the Pope’s Agenda of public activities. The Vatican Player allows websites all over the world to receive and redistribute images, sound and text concerning the Pope and the Holy See, on a regular basis. The 24-hour “Vatican Radio Live” channel has a strong audience on FM in the Rome area and on DAB and DAB+ in most of Italy, and encourages ongoing dialogue between life and culture in Italy and the Catholic Church in the country. Webcasting and satellite transmissions, along with rebroadcasting by local, regional and national radio stations, guarantee the widest possible outreach to Vatican Radio’s programming and services. Which is why Vatican Radio believes the time has come to reduce its reliance on traditional technologies, like Short and Medium Wave broadcasts, and to develop its resources in new directions. On July 1st, Short and Medium Wave broadcasts from Vatican Radio’s Santa Maria di Galeria Transmission Centre, to most of Europe and the Americas, will be suspended. These areas of the world are already well served by Vatican Radio’s local rebroadcasting partners and by widespread internet access to its services and language programming. The reduction of Short and Medium Wave broadcasts to these areas accounts for about 50% of the Centre’s transmission time and will allow Vatican Radio to restructure the Centre according to more innovative technological criteria. Short Wave broadcasts will be further reduced over the next few years – but not at the expense of those poor, needy and suffering parts of the world (like Africa, the Middle East and Asia) which have no alternative means of receiving news of the Church and the voice of the Pope. Over the next few days, Vatican Radio’s language programmes will be informing their listeners of these changes, indicating alternative ways by which traditional Short and Medium Wave users can listen and benefit from Vatican Radio’s services. Vatican Radio’s international Short and Medium Wave broadcasts have made a priceless contribution to the history of the Church, especially in 20th century Europe where they were a source of strength and encouragement for nations oppressed by war and totalitarian regimes. As this unique service is gradually phased out, making way for new communications technologies, it is important to thank those who dedicated their hearts and minds to it for so long – and for the good of so many. Mon-Fri 1800 English; 1900 Italian; 2000 French; 2100 German; 2200 Spanish. by strong signal of Radio Cairo English to Central & South Africa on 15345. 1455-1600 on 12225 or 12250. Checking day by day, maybe move on a new freq. Dear reader, we're sorry to inform you that the English service of Radio Netherlands Worldwide will be closing at the end of this month. As a result, this website will see some changes. From 1 July 2012 there will no longer be a daily review of the Dutch papers. Our coverage of Dutch news stories will also cease. And since RNW's English webstream will end on 29 June, there will be no more Listening Guide. We will continue to serve you, however, on this website, with background articles relating to our new brief: promoting free speech in areas where people are not free to gather information, or to form and express independent opinions. The measures are a result of steep budget cuts imposed by the Dutch government and a concomitant change in focus. Providing the world with a realistic image of the Netherlands, as we have proudly done since 1947, will no longer be one of our statutory duties. On 29 June we will broadcast a radio show looking back at the past decades of Radio Netherlands Worldwide. Have you got a memory to share? Please let us know, at the usual address, letters@rnw.nl. We'd love to hear from you. Shortwave in English to Europe at 1800 on 7275kHz and 2100 UTC on 3955kHz. Also targeted to America, Asia, Australasia and Africa at other times in English and 10 other languages. ** FIJI [non]. 11565, June 4 at 0829, I am alarmed to wake up and start the tape on pre-tuned frequency for much-anticipated new clandestine, Domo I Viti, which per WRN Broadcast would start today, Mondays only at 0830-0900 via Palau. Amazingly strong signal to be Palau, immediately raising doubts about the site. Surely it`s really WHRI in South Carolina, which after all is the station registered in HFCC at this time, not WHR`s T8WH. First hearing closing of gospel huxter in English, Voice of Praise, from Clinton TN, then PSA for WorldVision.org vis AIDS in Africa. 0830 tone test, pause, and then Domo I Viti starts by 0831. Nothing is in English except several references to Fiji Freedom & Democracy Movement, Australia. Presumably all Fijian, certainly nothing in Hindi or Tamil! Opening has talk over music until 0834 then just talk, 0836 bringing in someone on phone; 0839 host talks with music; 0842 mentions FF&DM again; 0855 ``South Seas`` sounding song. Tape ran out at 0859 but the click woke me up so heard 11565 cut off the air at 0900 sharp while the Fijian was still talking. It did start a minute late, after all. which is promoting the shortwave broadcast of "FDFM Radio in its first ever direct broadcast from Australia". Dxers' first task for this month is to contact the powers that be in Canada, names to follow, plus the CBC (Canadian Broadcasting Corporation), in order to stop them taking Radio Canada International off air at the end of June. An act of unprecedented Canadian cultural vandalism will occur, ironically by Canada Day (1st July), unless RCI is saved. Started in 1942, closure is no way to mark 70 years of quality broadcasting information to the world. "I am writing to draw to your attention to the folly of CBC cutting Radio Canada International’s English broadcasts on shortwave. I request that you use your powers to stop the CBC ending RCI broadcasts at the end of June. RCI is the voice of Canada to the rest of the world and its reputation as a leading world power, a tourist destination, a wonderful country with much to give and teach the world, will be irreparably damaged if you allow the CBC to stop broadcasting. People in Africa, Asia, and Europe all tune in as well as those in the Americas, to hear perspectives on how Canada lives, the diversity of its people and landscapes. Programmes such as The Link are about as good as it gets in radio anywhere, and to make such sweeping cuts is not necessary. People in the Third World do not all have easy access to the internet and rely on radio to get their news and information from beyond their own country. The internet is also at the mercy of the country’s government and can be switched off or blocked in ways that radio cannot. (see Libya, China, Egypt and others in the past year or so). Even worse though is that CBC is not even going to continue with RCI as an online broadcaster. Canada will be silenced forever, while other countries’ broadcasters-large and small will continue to have their views and culture aired to a global audience in many languages. China, USA, India, Russia, Japan, Australia, Germany, the UK all use shortwave, MW, FM, and the internet to tell the world’s population about their view on global affairs, sharing their music and art, history and tourist destinations... Smaller, equally important countries such as New Zealand, Thailand, Romania, Iran, Egypt, Nigeria et al also continue to broadcast their news and information to the world. Act now, please and ensure that RCI has a future. Rather than being prepared to dispose of its loyal audience the CBC should be funding RCI to build further audiences, to entertain and inform them for decades to come, just as it has done for so many decades past. Are you really prepared to let RCI drift off air forever? You have the ability, and the civic responsibility, to step in and stop such an act of cultural vandalism. Today, we celebrate the day of the people, died for the freedom and independence of Bulgaria. Sadly, most of today's people do not deserve it. Good night, heroes! 2000-2200 on  7205 ISS 500 kW / 190 deg to NWAf, registered freq. 2000-2100 on  9790*ISS 500 kW / 155 deg to CEAf, unregistered freq. called "Naatham" and is sponsored by the Transnational Government of Tamil Eelam. instead of 12250 first noted on May 20, 2012.